Edward Harry Styles, popularly known as Harry Styles is an English Singer, Songwriter, and an Actor. His career as a singer began when he had returned to form the boy band One Direction, after being eliminated once from the auditions of British singing competition The X Factor. 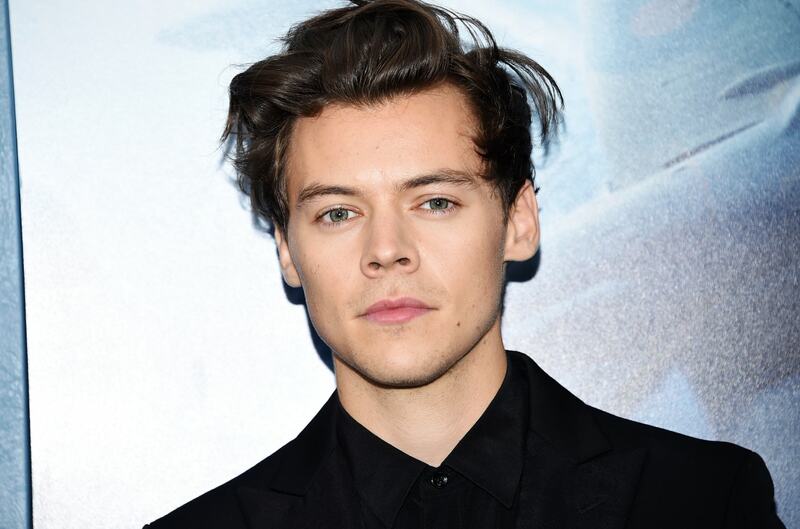 Harry Styles seems to love getting inked, he is known to have received his first ink at the age of 18years. He has more than 50 intricate inks on his body, which hold great importance for him. Let’s explore his tattoos and their meanings. Tattoo: Two Swallows facing each other inked on his chest. 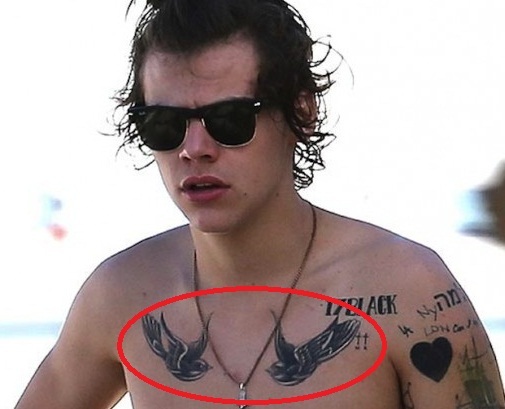 Meaning: The two swallows inked on Harry’s chest have their face inked in the same direction. This tattoo was used as the symbol by the sailors to represent their sailing experience usually tattoed on the chest, hands or neck. Swallows are the symbol of love and travel and it was believed that after the death of the sailor, the swallows would carry their soul to heaven. Harry as per his profession travels a lot, and thus he was encouraged to get this inked. Tattoo: Skeleton dressed in a suit inked on his left upper arm. 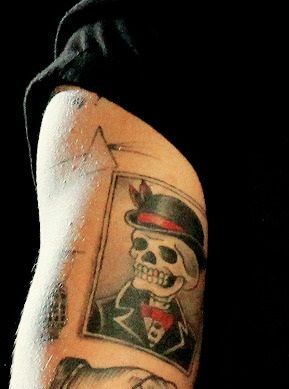 Meaning: In 2013, Harry got this tattoo inked, which is a creepy skeleton dressed up in a suit wearing a fedora hat. He had received it during the time of Halloween and had revealed it during One Direction’s Take Me Home Tour. 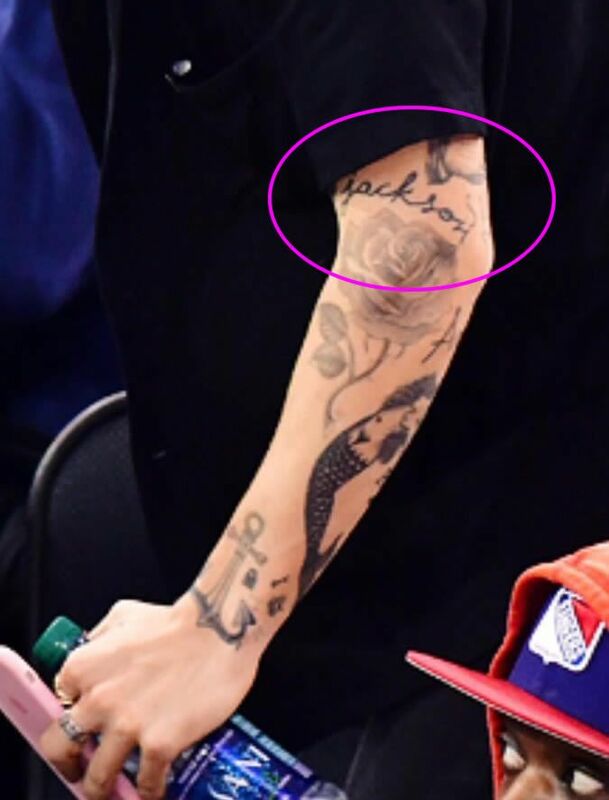 Meaning: Rose Tattoo is the symbol of love and romance. 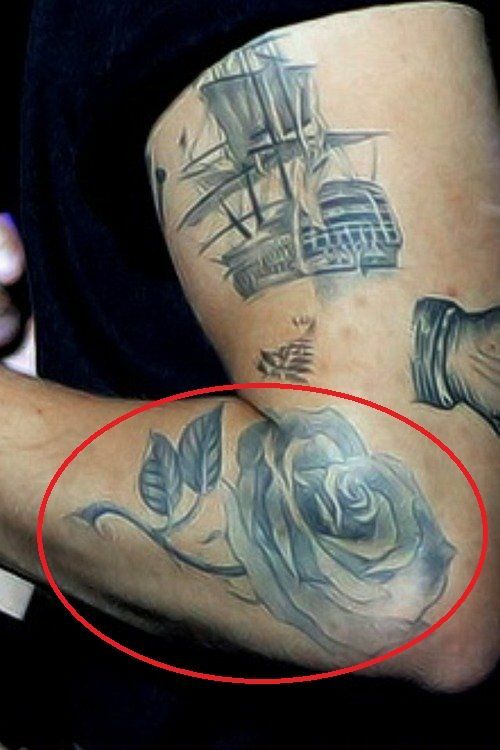 It is believed that Harry got this rose inked right under his ship tattoo on his forearm which he got inked along with his Ex-Girlfriend Taylor Swift. 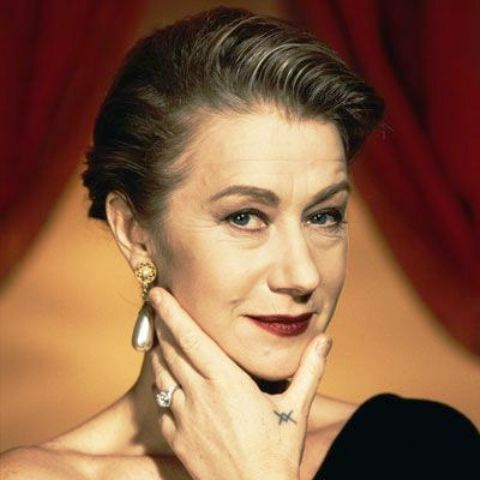 Thus, this rose is the tribute to his lost love since they are no more connected. Meaning: The tattoo is the symbol of equality. Tattoo: Naked Mermaid inked on the outside of his left forearm. 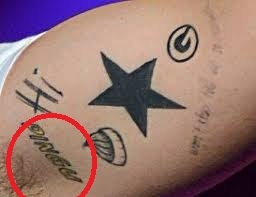 Meaning: The naked mermaid tattoo on Harry’s forearm was done by Liam Sparkles in the United Kingdom. Mermaid tattoo represents rebirth, danger, and seduction. 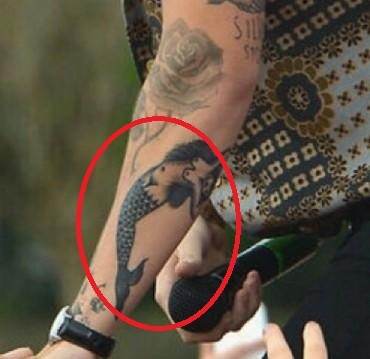 Harry was captured saying that he received this tattoo because he thinks he is a Mermaid. Tattoo: Eagle inked on his right arm. Meaning: Eagle Tattoo symbolizes courage and freedom. 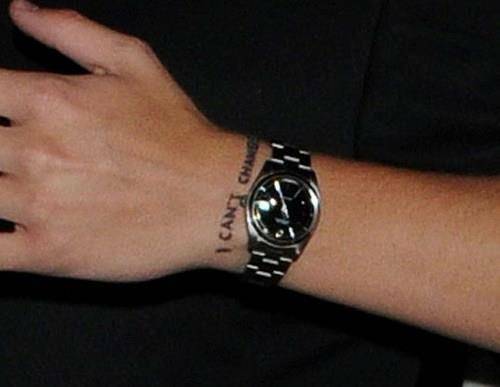 Harry got this ink to cover up his previous ink which included the words “Thing’s I Can”. He got this tattoo at the time when he began to reach the highest success level of his singing career. 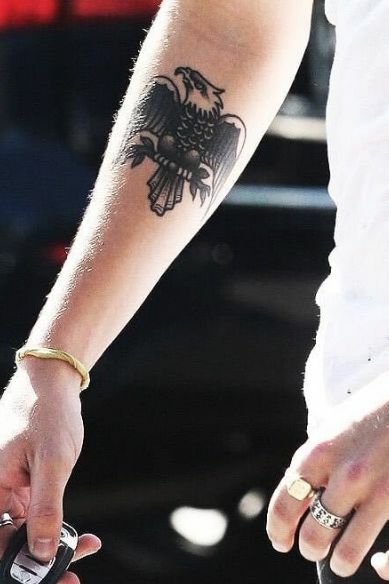 Thus, Eagle being a majestic bird, he was inspired to get it inked on his body representing the achievement of his solo career. 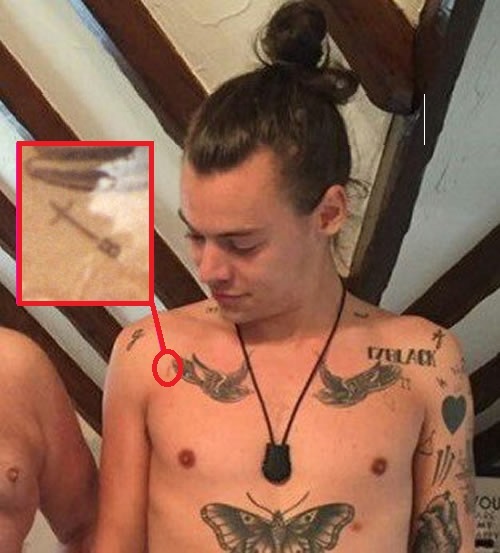 Tattoo: Three nails inked on the inside of his left bicep. 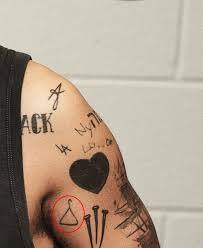 Tattoo: A coat hanger on the inside of his left bicep. Tattoo: A star inked in black on the inner side of his left bicep. Tattoo: Green Bay Packers Tattoo inked on the inside of his left forearm. Meaning: Harry Styles is the huge fan of Football, during one of their matches, Harry bet with his friend Cal that if Green Bay Packers won, he would get their symbol tattooed the next day. He reassuringly asked Cal if they were going to win, he still said yes. Harry got the tattoo inked the same day without even waiting for the match to end, and being unlucky enough, the Green Packers lost the game. Tattoo: A tiny cross inked near the thumb of his left hand. 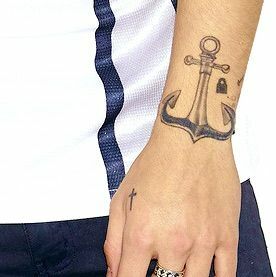 Tattoo: Anchor inked on his left wrist. 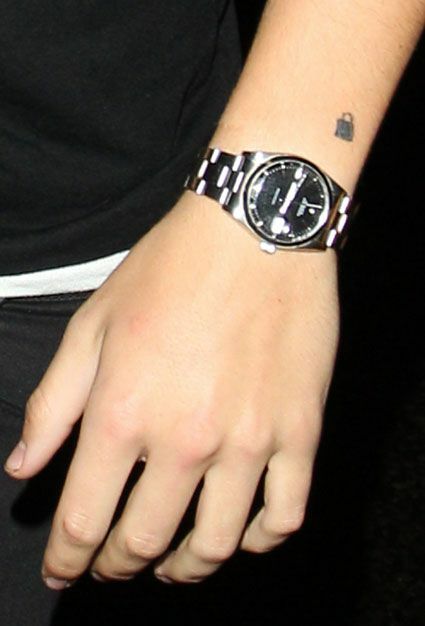 This anchor tattoo is the cover-up to Harry’s previous tattoo which included the words, “I Cant Change”. Tattoo: Late Late inked on his left upper arm. Meaning: During his appearance on the popular Late Late Show, Harry turned out to be the unlucky one. 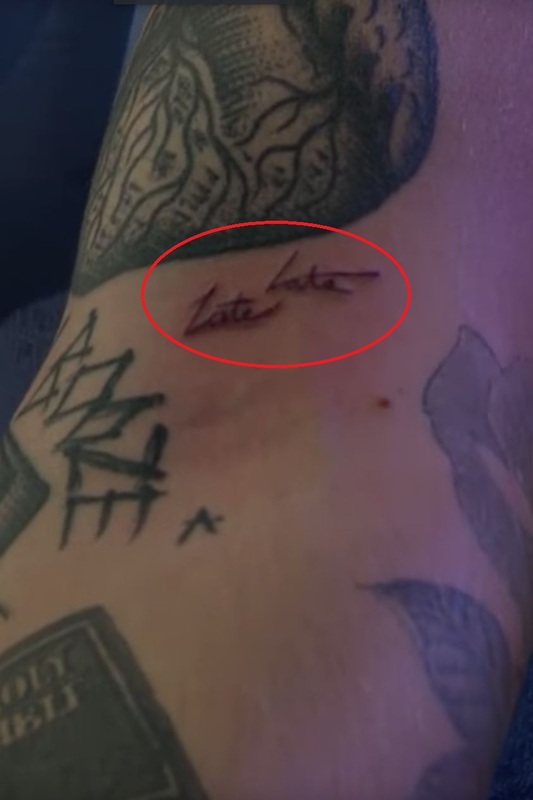 James Corden had One Direction band members pick out random boxes, Harry ended up with the Tattoo box and had to get the show’s logo tattooed on him. 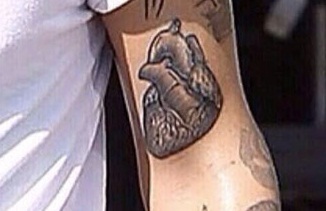 Tattoo: Huge anatomical heart inked on his left inner bicep inked by Tattoo artist Liam Sparkles. 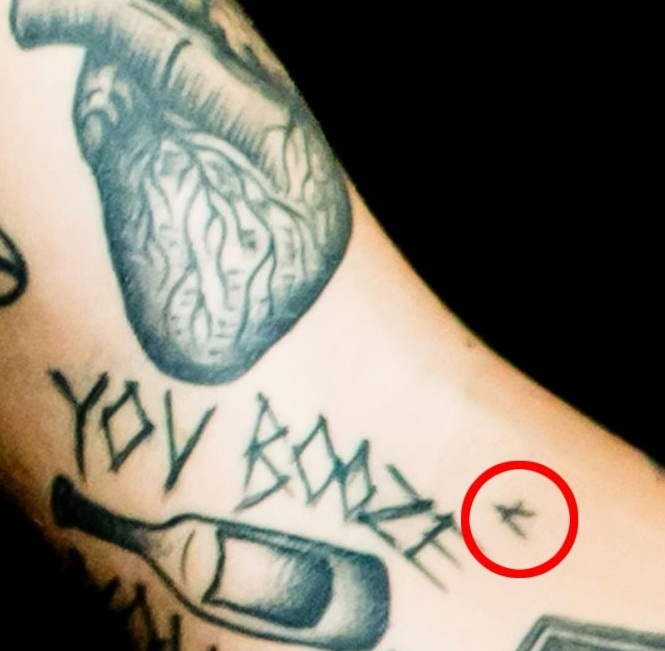 Meaning: It is believed that Harry got this tattoo after being inspired by his rumored girlfriend’s identical anatomical heart tattoo. 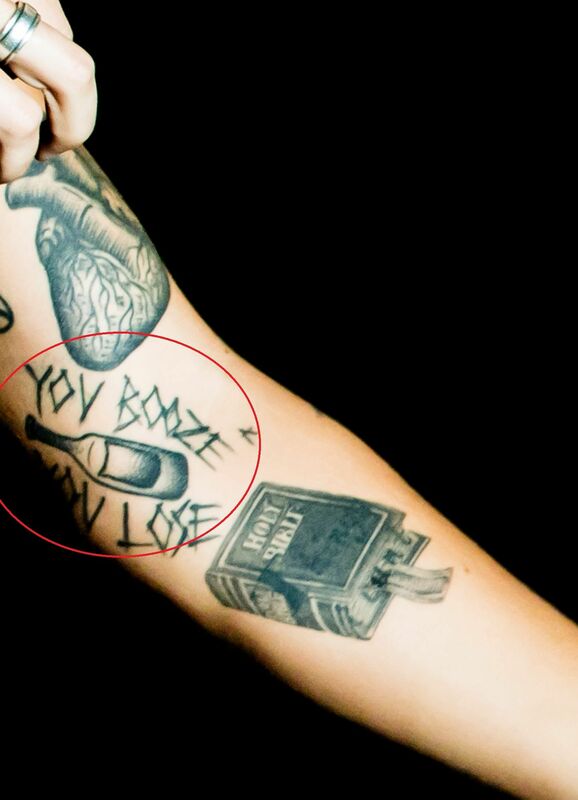 Tattoo: YOU BOOZE YOU LOSE, and a liquor bottle tattoed on his left forearm. 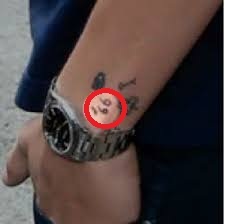 Harry got this tattoed from his favorite tattoo artist, Liam Sparkles in The United Kingdom. Meaning: Harry’s connection to Catholicism and thus his strong religious belief and love for his religion is an inspiration behind getting this tattoo. 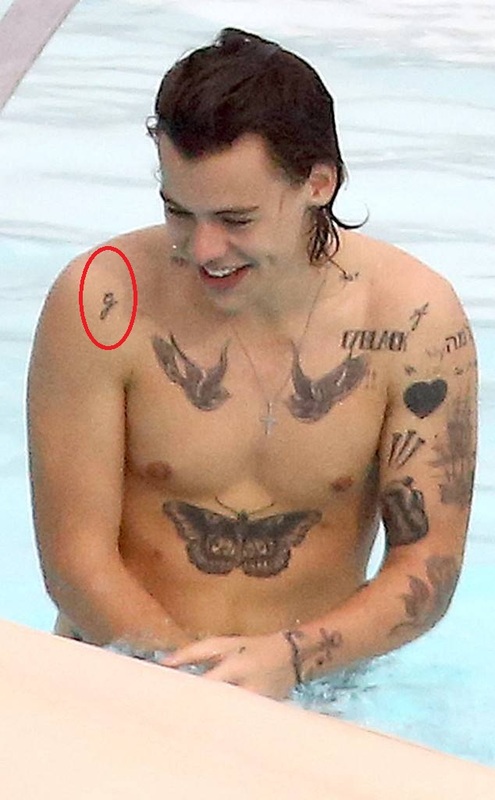 Meaning: The letter A inked on Harry’s Left arm represents the initials of his mother’s name, Anne Twist. Tattoo: Hi inked in the inner side of his left bicep. Tattoo: Iced Gem Cookie inked on the inside of his left arm. Meaning: Harry Styles got a tattoo inked in the honor of his older sister, Gemma who’s nickname is Gem. 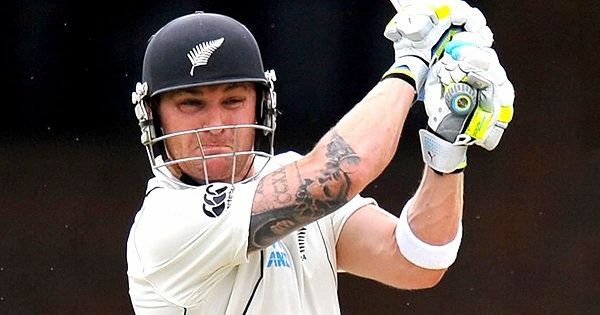 The tattoo includes iced gem cookie inked on the inside of his left bicep. Iced Gem is the British popular biscuit known as Iced Gem. 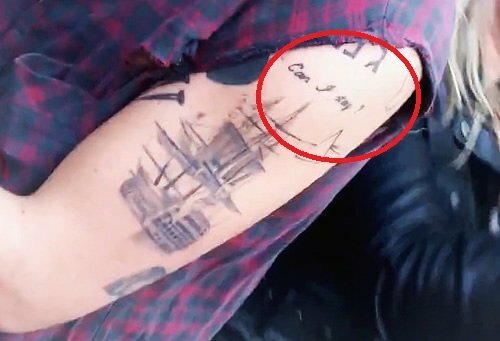 Tattoo: “Can I Stay” tattoo is inked on the upper part of his left arm, right above pirate ship tattoo and below the Hebrew tattoo of his sister Gemma’s name. Tattoo: Huge Butterfly inked across his stomach. Meaning: Butterfly represents transformation. Harry got this inked to symbolize his transformation of life through different stages. 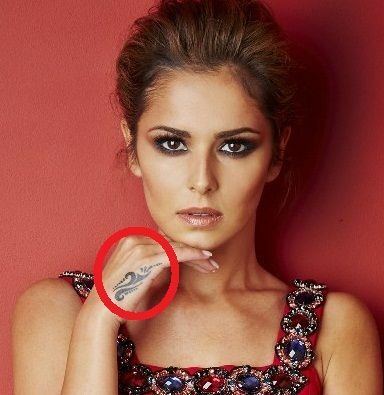 He had received it from tattoo artist Liam Sparkes. 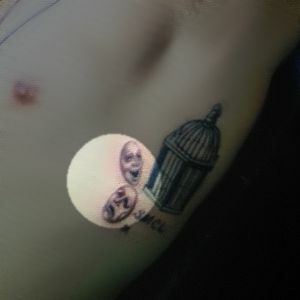 Tattoo: Two tragedy theatre masks inked next to the birdcage. Tattoo: SMCL inked directly under the Tragedy Theatre Masks. Meaning: SMCL stands for Smile Now Cry Later. it also includes an X inked along with it.. Meaning: Harry got this tattoo inked as a tribute to his musical background. 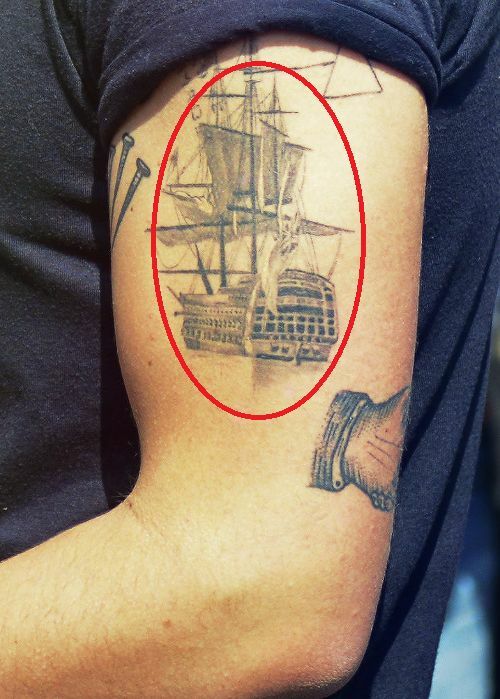 Tattoo: The traditional Pirate ship inked on Harry’s left bicep. Meaning: Harry in one of the interview said that this tattoo is just the reminder for him of traveling homeward when he’s off on his tours around the globe. 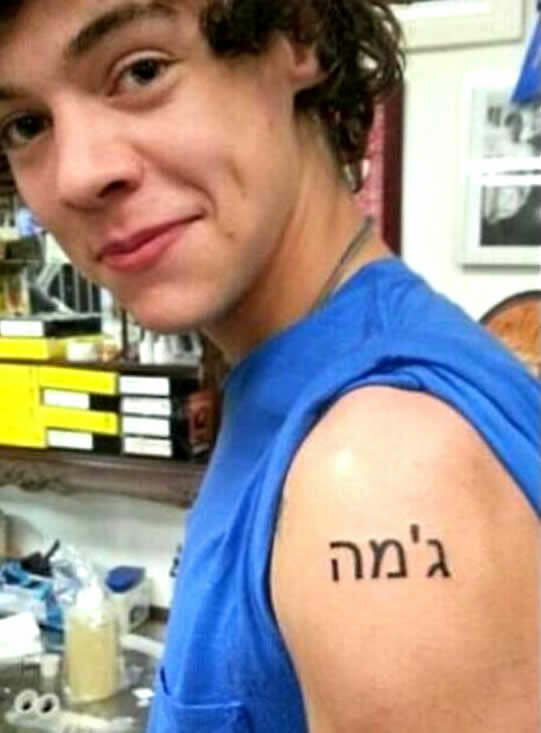 Tattoo: Gemma inked in the Hebrew language on his upper left arm. 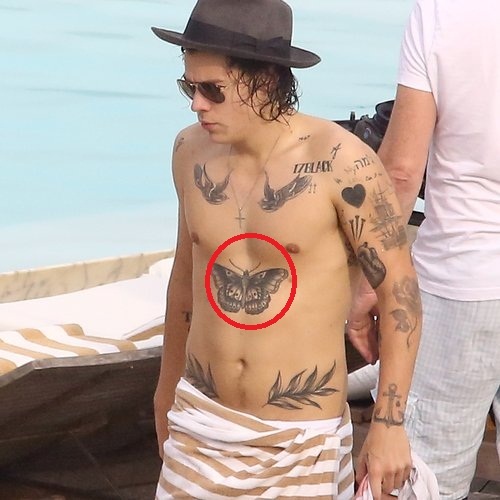 Meaning: Harry got this tattoo from Tattoo Artist Isaiah Negrete. Gemma is the name of Harry’s older sister. Meaning: Jackson is the name of Harry’s photographer, Calvin Aurand, who was the official photographer and archivist for One Direction. Jackson is Harry’s godson. 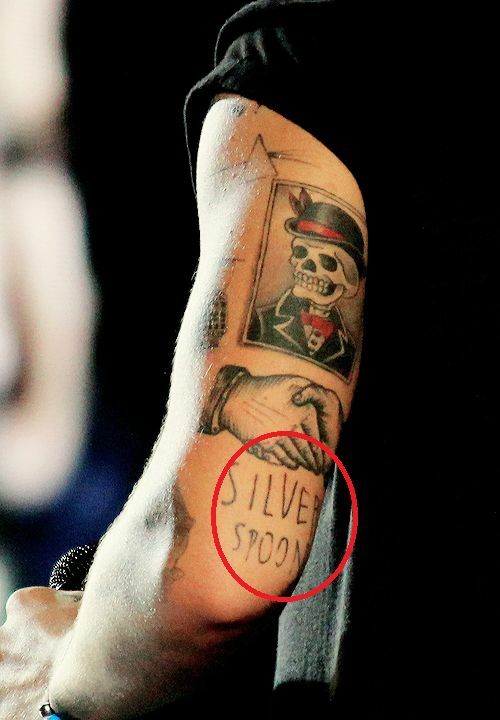 Tattoo: SILVER SPOON tattooed on the back of his left arm. 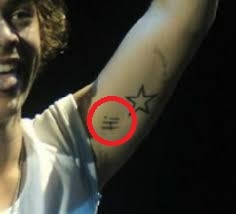 Meaning: This tattoo is the symbolism of the success of Harry’s band, One Direction. 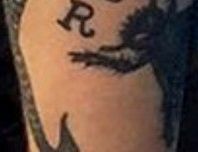 Meaning: “R” inked on Harry’s left forearm is the tribute to his stepfather, Robin Twist, who had helped Harry’s mother raise him and his sister, Gemma after she split from Desmond Styles (Harry’s Biological father). 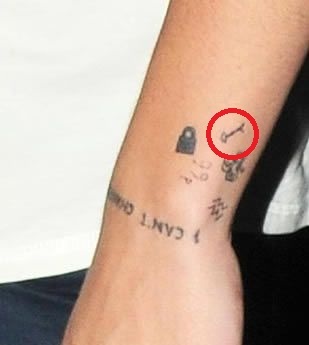 Tattoo: Miniature key inked on his left wrist next to padlock tattoo. This tattoo is similar to the tattoo of Harry’s Co Band member, Louis Tomlinson, who also has the same key inked on his right ankle. 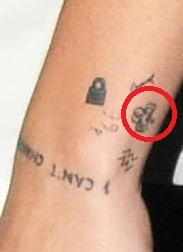 Tattoo: Padlock is inked on Harry’s left wrist. This tattoo was done by Ed Sheeran on Harry’s body on August 13, 2012. Meaning: Shamrock symbol inked on Harry’s body is the tribute to L.A.’s Shamrock Social Club Tatto Parlor, from where Harry is said to have received more than 40 tattoos. Tattoo: Aquarius zodiac sign inked just below shamrock tattoo. 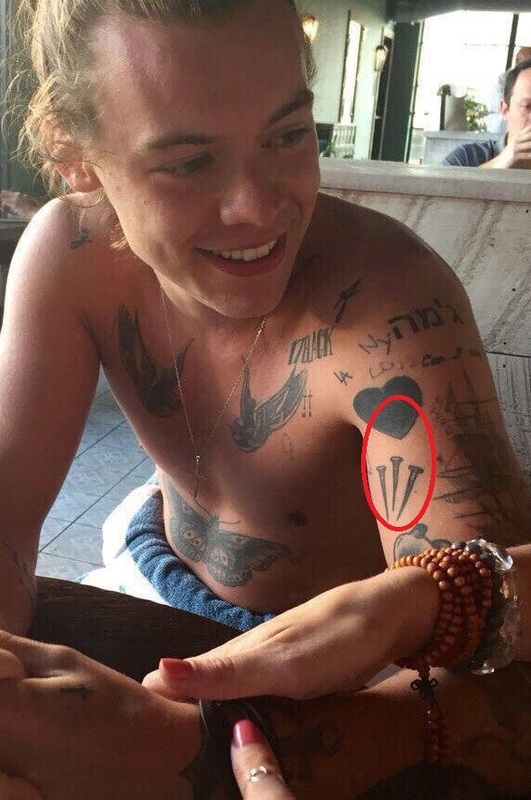 Meaning: The waves inked in a pattern on the left wrist of Harry represent his birth zodiac sign. 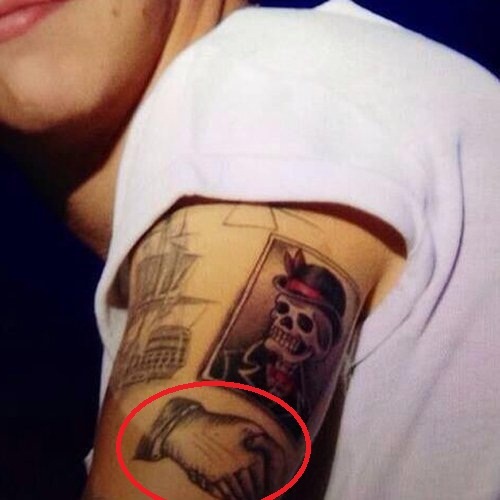 Tattoo: There are multiple propositions as to what inspired Harry to get this tattoo. Harry was born and raised in the UK, 99p means 99 pence, the British monetary sign. Tattoo: NEVER GONNA DANCE AGAIN inked on Harry’s feet. 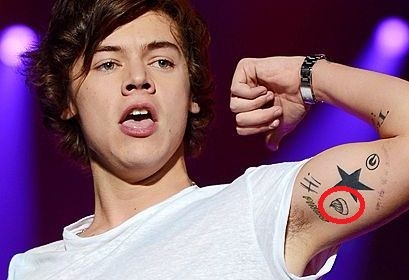 Meaning: G tattoo is the symbol of Harry’s love for his Older sister, Gemma. Tattoo: 1957 and 1967 inked on his left and right collarbones respectively. Meaning: 1957 represents the birth year of his father and 1967 symbolizes the Birth year of his mother. Tattoo: 17 BLACK inked near his left armpit. Meaning: Harry is a huge fan of James Bond. 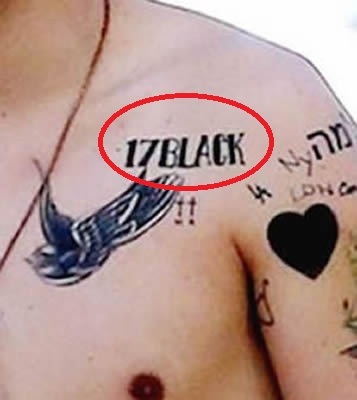 Thus, he got “17 BLACK”, the famous lucky bet of 007 inked on his body. Tattoo: Cross with a B tattoo inked on his right shoulder. Meaning: Harry is known to get inks in the love of his family members. This cross with B is supposedly in love for his maternal Grandfather, Brian Selley or Paternal Grandmother, Beryl German. Tattoo: Broken Heart inked near his left chest. Tattoo: Two fern leaves inked on each side of his abdomen. Meaning: Fern Leaves are the symbol of growth, endurance, and strength. Harry, in the pursuance of all his struggle through his life journey, got this ink done which covers a huge part of his body. 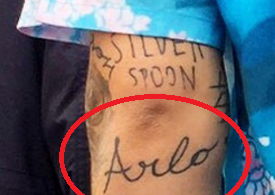 This tattoo is the cover-up of his previous ink which said, “Might as well”. Tattoo: Brasil inked on his left upper thigh. 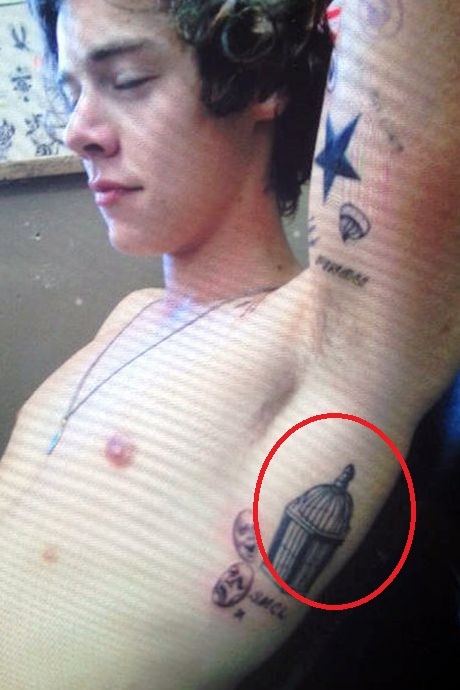 Meaning: During One Direction’s tour to Rio de Janeiro, Harry was inspired by the city to such extent that he had got this permanent tattoo etched on his skin. 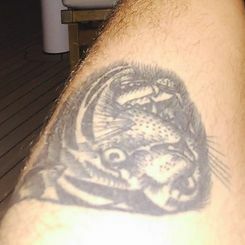 Tattoo: Huge Tiger inked on Harry’s left thigh. Meaning: Tiger tattoo is the symbol of Pride, Passion, and Courage. Tattoo: Two small crosses on his left chest with K and M written under them respectively. 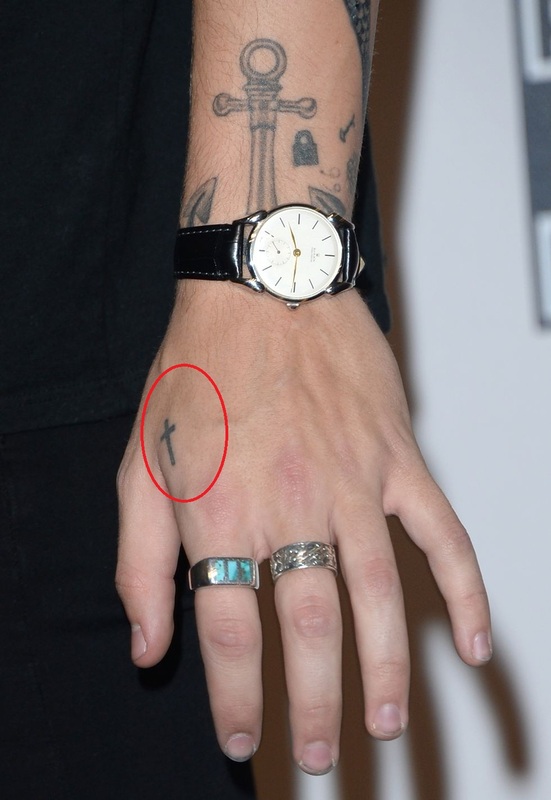 Meaning: Cross with K tattoo represents the initials of his Paternal Grandfather, Keith Fredrick Styles whereas the Cross Tattoo with M represents the initials of his Maternal Grandmother, Mary Smith. Tattoo: PINGU written on his left inner bicep. Meaning: PINGU tattoo holds great relevance for Harry. This is a “bro tattoo” with Ed Sheeran since he has a similar tattoo with a difference that Pingu character is inked on his body. Both of them had decided to get these tattoos inked in love for the famous character PINGU (Penguin character of the children’s claymation series- PINGU). 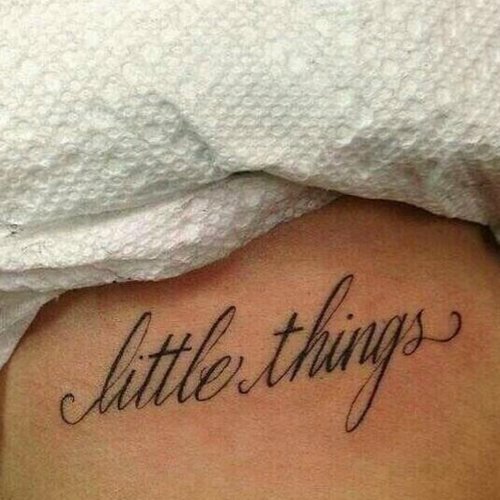 Tattoo: This tattoo is actually inked in honor of one of the band’s recent tracks – “Little Things” from their Take Me Home album released in 2012. Tattoo: X inked on Harry’s right ankle. 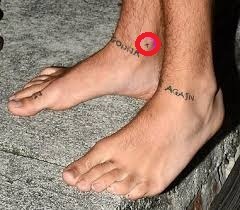 Tattoo: Two screws inked on Harry’s right toe.